Here is a layout page for a baby boy album. This layout was created with navy blue, red, and white paper. I made two 4 x 6 rectangles, with color of your choice. In this case I used red blue first then matted with red. This way the picture will fit perfectly over the blue. Then I took the first haircut sticker pack from Jolee's. 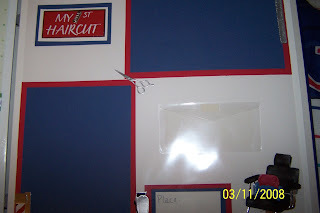 I used the sign 1st Haircut and also matted it and put it in the upper left hand corner of the page. I did this to give it a Title. I also created another sign at the bottom of the page in the right hand corner to add the place, time and date of the first haircut. I also placed the barber chair next to it. Above the barber chair is a pocket envelope that holds some of the first haircut for safe keeping. I than scattered the rest of the sticker pack in different areas on the page. I created this page and many more for a baby shower gift for my son's teacher. She was thrilled and is working on it currently. The babe is currently nine months old. She was not a scapbooker but now you can officially say that she is loving creating the album withe pictures. Her and her husband love looking over the pictures and seeing how fast the baby is changing.